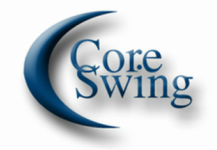 The Core Swing Golf shirt was designed for easy use. The buttonhole elastic tightens around the bicep of each arm, holding the arms in the right position to help the golfer make the correct torso turn. By tucking the shirt into your pants insures the right tension to allow the arms to swing freely and in the proper swing position. Staying connected: Hands, arms and upper torso move as one and is fundamental to the golf swing according to all golf teachers and swing coaches. Our customers love the fact there are no "swing thoughts" and they can just swing the club and let it happen!